When we are mindful we use restraint and guard the six sense doors--hearing, seeing, smelling, tasting, touching, and cognizing (e.g.,thinking, knowing). What this means is that we are watchful for what is arising at the doors, we note it, and we don't admit it in the sense that we don't get caught up with it and all our associations to it. One can think of a guard who protects a household against intruders. When an intruder shows up, the guard alerts the household to the presence of the would-be intruder, thereby ensuring that the intruder does not get past the door. The other day I was observing my dog Blue. He is an old dog and has lost his hearing. Our house is in the country and quite a ways from the road in front. 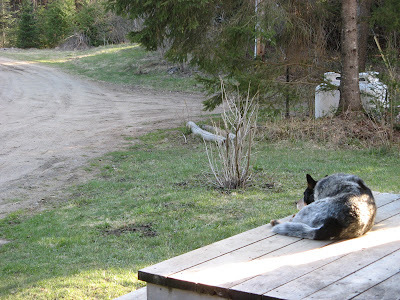 Blue used to start barking whenever a car or truck came down our driveway long before he could see it. Now he spends much of his day sitting on the front deck staring at the point at which a vehicle would first be visible when it came down the driveway. This day I heard a truck coming long before he did. However, once it was visible, he started barking. It was a propane delivery truck. Although he puts on a good show of fierceness, he is actually a very sweet dog. His basic friendliness is betrayed by his tail wagging. I guess that the propane delivery man knew Blue because he went about his job without any evidence of fear even though Blue continued to make perfunctory barks for a while before he resumed his post on the deck. If I had not already heard the truck, I would have first known it was there by Blue's barking. He was doing his job, although somewhat belatedly. He was alerting me to the presence of the truck by barking as if to say, "Look, something has arrived!" In his way, he was practicing a bit of mindfulness for me.